It is shortly before noon on Friday the 27th. Students trickle into room 144 of the Arts center, fill in name tags, and mill around waiting for the workshop to begin. On the other side of the room hang puppets and next to them a pile of artificial pine twigs. Over the course of the next two days, these transform into forests, spirits, Gilgamesh and Humbaba, the wolf and little red riding hood. 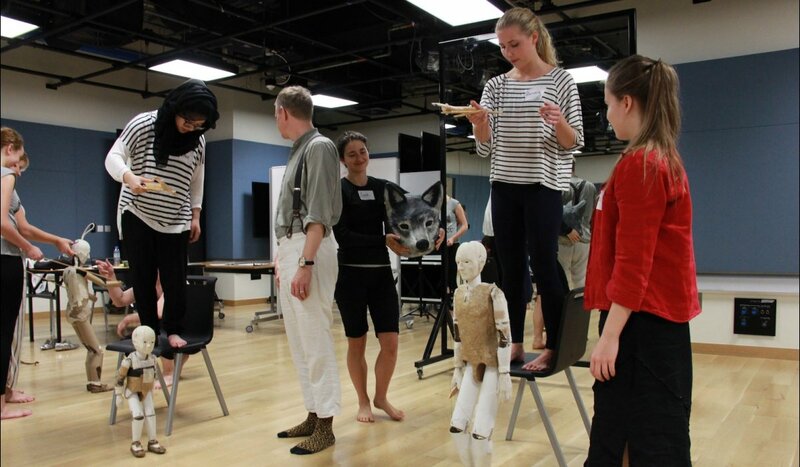 The workshops on Friday the 27th and Saturday the 28th were part of a collaboration with the innovative theater company Phantom Limb for the development and commissioning of their new piece, Memory Rings. The company was founded in 2007 by installation artist, painter and set designer Jessica Grindstaff and composer and puppet maker Erik Sanko. In the introductions, Jessica and Erik described the process of forming the company; drawing from both of their backgrounds, they created work and discovered they were making theater. The room was filled with many students majoring in theater, interested freshmen, a few global academic fellows, Jessica Grindstaff and Erik Sanko and two of their collaborators, Carlton Ward and Lucie Baker. For the next two days, Jessica, Eric, Carlton and Lucie gave us a view into their creation process. 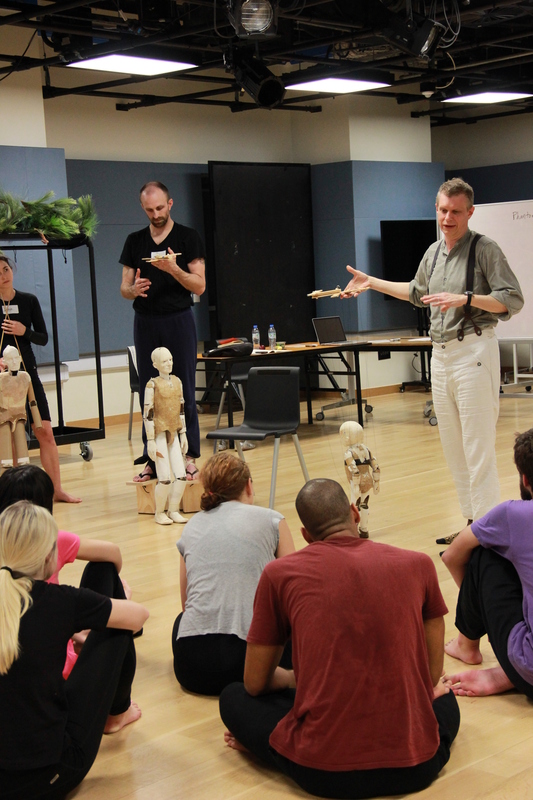 After introductions, we were taught the basics of how to operate the marionettes and from there immediately began creating small scenes with them. 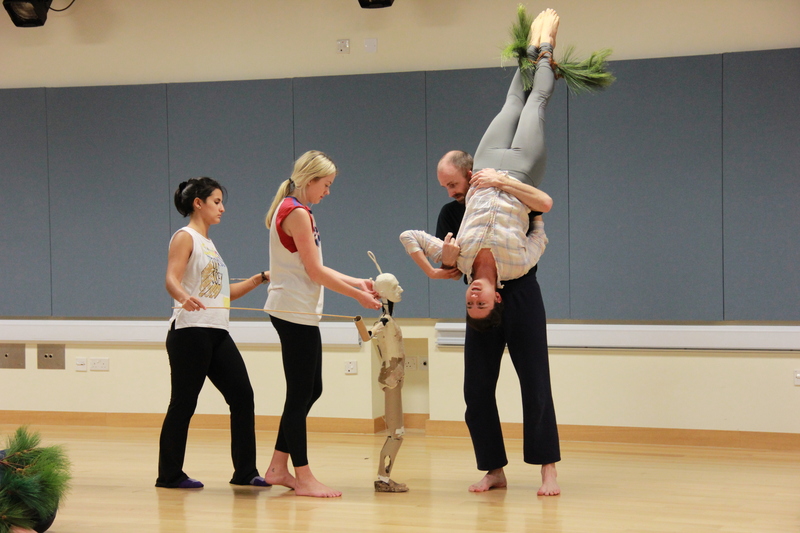 Phantom Limb’s pieces use abstraction, movement, and marionettes to convey their meaning. In the entire development of Memory Rings, Phantom Limb is only using one piece of text: a recording of an excerpt of Nietzsche. Part of the workshop was a chance for Phantom Limb to edit the ending to Memory Rings. Jessica Grindstaff and Erik Sanko and their collaborators came to Abu Dhabi to research and develop, Memory Rings, the second work of a trilogy, which includes 69 ºS. The works are all linked through a concern with ecology and the environment. Through fairytales, fables, and the epic tale of Gilgamesh, Phantom Limb is investigating memory and a changing environment. The piece, co-commissioned by the NYU Abu Dhabi Arts Center, will premiere later this year at OZ Arts Nashville in June.